SPOILER ALERT: If you haven’t read Heart-Shaped Hack yet but plan to, you may want to skip this entire post. I’ve received quite a few tweets, e-mails, and private messages regarding the publication date of White-Hot Hack, so I’m going to try and answer some of your questions. First of all, I’m overjoyed that so many of you are looking forward to spending more time with Kate and Ian. They’re two of my favorite characters and I’m glad I don’t have to let go of them just yet. Many of you have asked how many books will be in the Kate and Ian series. I originally wrote synopses for three books because I’d tossed around the idea of writing a trilogy, but once I finished Heart-Shaped Hack, I realized the complete story could really be told in two books. Sometimes the second book in a trilogy can end up feeling like a set-up for the third and final book, and I didn’t want that to be the case here. If anything should change (and I don’t anticipate that it will), it will be clearly marked in the description of White-Hot Hack so you’ll know for sure whether it’s the final book. Some of my readers were upset to discover there would be a sequel to Heart-Shaped Hack because they prefer to wait until all books in a series are published before they start reading. While I completely understand this, there’s a plot element in Heart-Shaped Hack that could have potentially been spoiled if this information had been shared at the beginning of the book instead of the end. (As I’d anticipated, most of you guessed the “twist” and those who didn’t probably spent some time around the 70% mark wanting to kill me). There were in-depth discussions between myself, my publicist, my beta readers, and my peers about the best way to handle this potential spoiler issue, and the consensus was to err on the side of caution. The fact that Heart-Shaped Hack can be read as a stand alone book was also taken into consideration. There is no cliffhanger and it’s a complete story with a happily-ever-after/happy-for-now ending. White-Hot Hack is simply the next chapter in the lives of Kate and Ian. I’m not an especially fast writer and usually complete at least three drafts before I’m ready to send the manuscript to my beta readers. Then I need another 6-8 weeks after that to tackle revisions, polish the manuscript, go through the copyediting process, and have the final pass proofed and sent to the formatter. One book every 9 months is about the quickest I can write; anything faster and I’d be worried that the final product would not be well written and/or edited. This is just *my* process. There are many authors whose timelines are much faster. The official publication date of White-Hot Hack won’t be released until I have a better idea of my timeline for finishing, but I’m shooting for late spring/early summer. I’m working on the blurb now, but I’d like to get a little further in the writing process before I release it. This helps me avoid having to tweak it later if something should change plot-wise. I’ll be revealing the cover soon (sometime in the next 3-4 weeks). I can’t wait to show it to you! If you’d like, you can add White-Hot Hack to your Goodreads shelves here. Thank you for your enthusiasm, everyone! And please feel free to reach out to me via social media should you have any further questions. “Sure,” he said, looking over her shoulder as if there was something very interesting across the room. “Take care, Kate.”That was yesterday, and so far only a few additional donations had trickled in. She and Helena spent the rest of the afternoon making calls to local churches and schools to set up additional food drives while continuing to monitor the donations page. Finally, at a little before three, Kate went into the back room to recount their inventory. It was the end of the month and they were down to their last cases of infant formula and baby food. Almost all of the canned vegetables had been depleted, and they were completely out of peanut butter and soup. If it was this bad now, Kate didn’t want to think about what might happen when budgets were stretched even thinner by holiday spending. Dejected, she was sitting on the floor, clipboard in hand, when Helena burst into the back room. Today I’d like to talk about the inspiration for my latest novel. I’d mentioned on my Facebook author page late last fall that my next project was going to be a second-chance romance called The Girl He Used to Know, loosely inspired by the song “Same Auld Lang Syne” by Dan Fogelberg (the one about running into your old lover at the grocery store on Christmas Eve). I’d already done quite a bit of research for this book. I’d written the synopsis, and I had a word document full of notes. I was very excited about writing this book. I’m still very excited about writing this book. But that’s not the book I ended up writing. Sometime during the early morning hours of October 2nd a book idea came to me in a dream. I woke before my alarm and I remember lying there just thinking about it. The dream itself was weird and didn’t make sense, and I couldn’t really remember the specifics. But the idea part was very vivid. But I went downstairs, poured myself a cup of coffee, and opened a new word document. I typed in one sentence that summed up the book idea, saved it, and went about my day, preparing to really get down to business on drafting The Girl He Used to Know. But later that afternoon I started making notes for the dream book. And once I started I didn’t stop until I had about 5,000 words. I had a loose outline, scraps of dialogue, and whole scenes. I’d named the main characters. Everything was kind of a blur and I almost couldn’t type fast enough to keep up with the ideas that were pouring from my brain. I told my husband I felt very conflicted. I always know what I’m going to write next, and it felt wrong to change my mind. I’m a planner. I don’t wing anything. But I decided there was no harm in spending a few weeks with this idea to see what would happen, and that’s what I did. I ended up falling for the characters. I liked each of them separately and I loved their lively banter. They made me laugh. I felt like I had a front-row seat in their world and they were showing me their story. I sent the first sixty pages to a few trusted friends and their excited feedback and enthusiasm inspired me to keep going. It’s an adult contemporary romance, and I always felt really happy when I was working on this book. It’s lighter than Every Time I Think of You, and I really needed that. For the most part, the two main characters are together on every page. I haven’t done that since On the Island. Tomorrow I’ll be revealing the cover and blurb so I hope you’ll stop by and take a look. I’ll be using the rafflecopter flash giveaway app to select one winner who will receive a digital ARC (as soon as they’re ready). Writing Process Update – Revision Stage! Here’s another update for those of you who enjoy hearing about my writing process. I’ve completed the first draft of my new book. I actually typed THE END almost two weeks ago, but then proceeded directly to the second draft, also known as the beginning of my revision stage. The first draft is where you meet your characters and learn about their world. Revision is where you find your story. I feel – very strongly – that this stage is the most important part of the entire writing process (and for me it’s obviously the most enjoyable). You find out a lot about your characters in the first draft, but in order to develop them fully – to give them dimension, to make them leap off the page, to ensure their actions make sense – you need to be able to look at the story –and the active role your characters play in it – as a whole. And I really can’t do that until I’ve written the first draft. The first thing I do when I start the second draft is send the first draft to my Kindle. Then, as I read the entire manuscript straight through, I highlight sections and take notes, adding them to the items I’ve already listed in my revision checklist. For example, there is an element of the hero’s backstory in the first draft that is totally cliché, and I’m sort of embarrassed that I couldn’t see it. But that’s one example of why revision is so important. Often the first idea that pops into your mind is the one everyone would probably think of, so it needs to be replaced by something not quite as obvious. A character’s backstory is part of the reason they act the way they do, and – bonus! – the element I came up with in the second draft actually makes more sense for the hero. Double bonus – it added some more dimension to a secondary character as well. This is the power of revision. I mentioned in my earlier updates that I’d written a synopsis of this book for my agent, and that it had really helped give me a road map to follow as I wrote the first draft. But with the good comes the bad, and there was one particular plot point in the synopsis that really didn’t work the way I needed it to once I’d written it. And that drove me NUTS because it was a pivotal plot point and I thought it would be so awesome when I finally got to write it. Because by the time I wrote it, I knew a lot more about my characters and their motivations. And the reactions of both characters in this particular chapter didn’t really ring true for the stage they were at in their relationship. This realization was incredibly frustrating and at first I tried to force a solution, which only made it worse. Last week I was on vacation with my family for spring break. I had lots of time to let my mind wander and when the answer finally came to me, I realized where I’d gone wrong and what I needed to do to fix it. But I was only able to do this by looking at the story as a whole (and allowing myself the necessary time to figure it out). Interestingly, I had originally planned for this chapter to occur earlier in the book but then moved it a few chapters later. This no longer works, so I’m re-writing the whole chapter and moving it to where I’d originally planned for it to go. Sometimes this is the only course of action and I’m just thankful it was one chapter and not half a book. However, any time you pull a plot thread you run the risk of loosening something in another location, which means I now have a few other things that also have to be changed and moved. 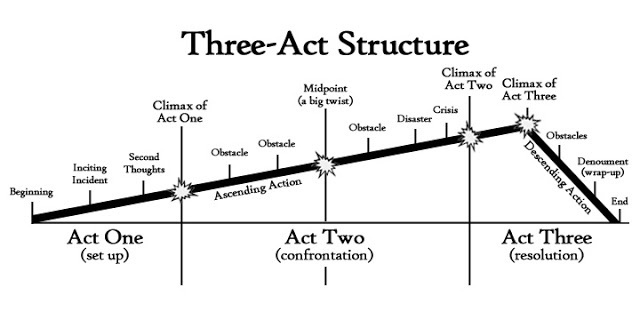 One of the other things I’m able to do once I have a completed first draft is look at my story arc. 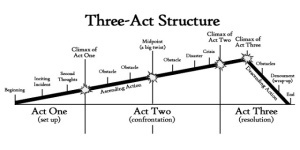 I like using a three act structure (you may need to click on the picture to see it better). This doesn’t mean it has to be followed 100%. But it’s a great way to see if I’ve got rising action (including enough smaller conflicts), a big enough main conflict, and a nice wrap up. I hope to be done with my revisions by early May. Then I’ll send the manuscript off for beta feedback. After that, I’ll write the third draft, do a hard line edit for grammar and rhythm, and give it a final polish. This is why I’ll probably always be a 1 book a year (or maybe 1 book plus a novella) author. I’ve learned (the hard way) that I really do need this much time in order to be satisfied with a book. I would love to give you more details about this book (including why I decided to write it) and hope to do so in the next couple of months. I can tell you that it’s not The Girl He Used to Know, which is what I had planned to write next. I’ll still be writing that one, but not until I’ve completed my current project. This new book is straight-up adult contemporary romance, which is something I haven’t done since On the Island (at least in a full-length novel). 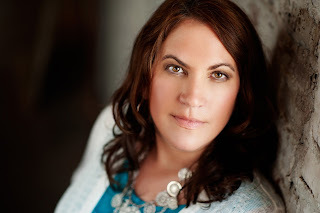 After the heavier subject matter of Every Time I Think of You, I really needed to write something a little lighter (and I think my readers are ready for that, too). In one word, this book is fun. The hero and heroine have lots of dialogue (and banter!). There is an external conflict in addition to the romantic conflict, which is my favorite kind of contemporary romance. Many of you have asked for a bit more steam, and I tried my best to kick it up a bit. However, you still won’t see certain words because I don’t think they’re necessary, nor do I personally find them romantic. The heat level of this book is similar to Jill Shalvis (who’s an author I love). So there you have it! I’m very excited about sharing more on this project in the coming months. Today I’m celebrating the release of Cherish, the novella-length sequel to Covet. I want to thank everyone who reached out to me over the past year, asking if I might consider writing a sequel to the story. It’s because of you that I finally decided to continue the story from Daniel’s, and his ex-wife Jessie’s, point of view. (Major Covet spoilers from this point forward). For the longest time, I had no plans to write a sequel. But something happened during the revision of Covet which left the door wide open for me to explore a particular storyline. I didn’t know at the time how grateful I would be for that. The ending in the published version of Covet is different than in the earlier drafts because in those drafts, Daniel did not survive being shot in the line of duty. I wrote funeral and cemetery scenes and was pretty much a bawling mess during the whole time I was writing them. I’m not exactly George R. R. Martin, but characters can and do die in my books (7 so far, if anyone’s counting. Is that a lot? I sort of feel like it is). Anyway, I point this out only to highlight that it’s not out of the realm of possibility for me to kill off someone. But sometime during the writing of Covet, Daniel’s death started to feel a bit gratuitous to me. Was I killing him in the name of emotional manipulation instead of what was best for the story? Also, I’m a big fan of characters having to answer for their actions, and if Daniel wasn’t in the picture there would really be no reason for Claire to ever tell Chris about her and Daniel’s relationship. Before I sent the manuscript to my beta readers and editor, I told them I had an alternate ending I wanted to discuss but that they should read the original first. If memory serves, it was pretty unanimous that killing off Daniel worked fine, but that not killing him worked better. One of my betas said, “You know what I kept thinking? That I wished there was someone for Daniel so that he could have his own happily-ever-after. Like maybe with Jessie.” We brainstormed a little and I mentioned the idea about Jessie still being listed as Daniel’s emergency contact. It all fell into place fairly quickly after that, and I re-wrote the ending. And in the back of my mind I knew the story wouldn’t be complete until I explored how this new ending would ultimate affect Daniel and Jessie. I guess you’re all about to find out. 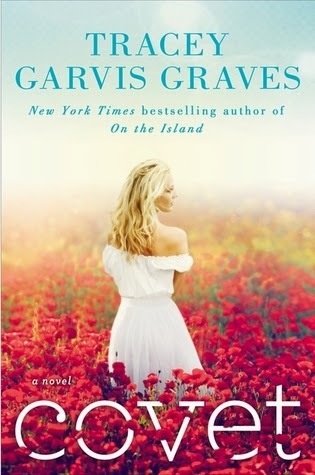 Please head over to my author page on Facebook for the opportunity to win signed copies of On the Island, Covet, Every Time I Think of You, and Cherish. Every Time I Think of You Is Available Now! Today I’m celebrating the release of my third full-length novel, Every Time I Think of You, and I’d love for you to celebrate with me. I’ve been waiting rather excitedly for the release of this book, and I can’t wait to share it with you. Don’t forget to scroll down to the bottom of this post so you can enter the giveaway. There are lots of fabulous prizes up for grabs, including signed books, gift cards, an ARC of my next book, and the opportunity to name one of the characters! Finally, I will either use the winner’s name in The Girl He Used to Know (first name or last name only, or your actual real name if comfortable) OR the winner can suggest a name for a character. **The restrictions are that it will not be the name of a main character. It will be a supporting or minor character. Also, this is a fictional character. It is not a character based on the winner. 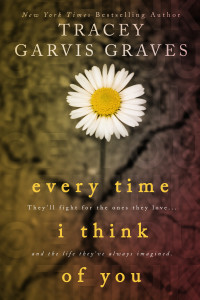 It’s hard to believe that the publication of Every Time I Think of You is only a few weeks away. Cherish is not far behind and will be here in a couple of months. Two releases six weeks apart? How did that happen? I’m just as surprised as you are. Here are the pre-order links for Every Time I Think of You (release date 9/16/14). I thought it would be easier to put them all in one post instead of trying to post them individually on Facebook and Twitter. Here are the pre-order links for Cherish (Covet, #1.5) (release date 10/28/14). I’m so excited to share the cover of Cherish with you today. Sarah Hansen at Okay Creations has once again worked her magic. Isn’t it gorgeous? Readers have been asking me for almost a year if Daniel would ever get his own happily-ever-after. For the longest time I wasn’t even really considering it. I didn’t have anything in mind for how I’d want the story to play out, but then an idea hit me pretty hard. Suddenly, Daniel (and Jessie) were all I could think about. I typed furiously, trying to get all my thoughts down so I wouldn’t lose them. I told my husband I wanted to write the story and I outlined it for him when we were in the car (I had a captive audience – he couldn’t escape and had to listen to me ramble on). So, if you’ve been wondering what happened to Daniel after he was injured in the line of duty, you’ll be able to find out on October 28th. Cherish is a novella-length sequel, not a companion or alternate POV story. 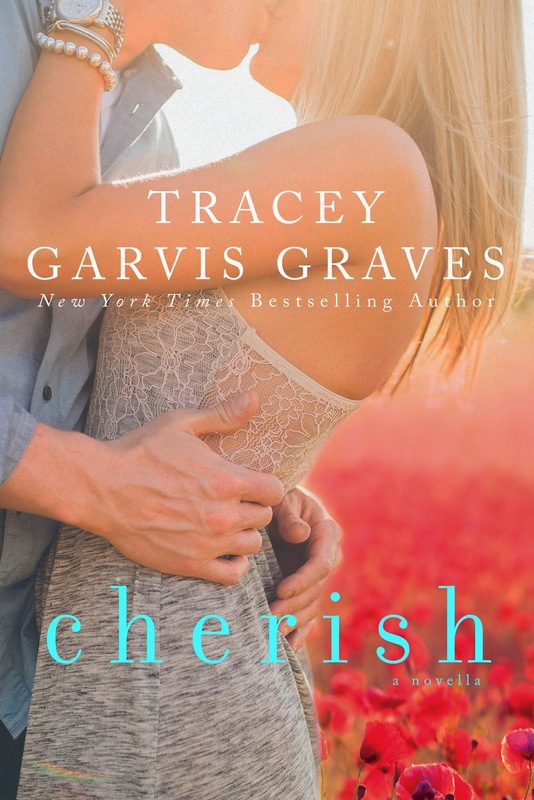 If you adore second-chance romances, Cherish is for you. Would you like to pre-order Cherish? Simply click on the highlighted link below. Pre-order links for additional retailers will be coming soon, and I’ll post them as soon as they become available.